[S10] New Zealand Government Birth, Death & Marriage Indexes "NZ BDM #M3698 (NZ)." [S14] Newspaper - Australasian, 9 Jun 1906, p60. [S5] Registry of Births Deaths and Marriages Death Index Victoria 1921-1985 "#D840 age 72." [S5] Registry of Births Deaths and Marriages Death Index Victoria 1921-1985 "#D19246 age 82." [S131] Electoral Roll for Australia, 1931 ""Belle Vue" only mentioned in Gertrude's registration." [S80] Ancestry - Family Tree, My Family Tree Owner: CHRISTINAJACOBS70. [S14] Newspaper - Ashburton Guardian (New Zeraland), 23 Feb 1909, p2. Further to the article about Upper Beaconsfield's old orchards in the May 1988 issue, Stan & Beryl Hamilton have kindly added the following information about the orchard numbered 52 in the article. 8 Aug 1931, Settler Achieves Success With Fruit At Beaconsfield Upper. EXPORT APPLES. High Prices Revised. By "CULTUS". In all parts of the State the efforts of settlers have shown that while some find the greatest difficulty in acquiring knowledge concerning primary production others display aptitude which soon manifests itself and is followed by profitable results. 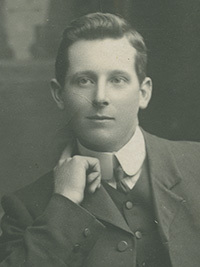 A notable instance of initiative and well-directed energy is furnished by Mr E. C. Hamilton, who had no experience of the cultural side of the fruit industry when he purchased a block of 40 acres which included the "Springfield" orchard of 20 acres, at Beaconsfield Upper within 40 miles of Melbourne, from Mr R H Bunt between five and six years ago. Previously Mr Hamilton had been associated with general trading and commercial pursuits in different parts of the Commonwealth. Desiring a more settled occupation, he decided to engage in the production of fruit, and has become a very capable orchardist. While admitting that there was much to be learned about the treatment of trees, compara-tively little difficulty, he recently stated, had been experienced. "Springfield" was planted 23 years ago by Mr Bunt in a well-designed manner with the trees 22 feet apart in one section and 20 in the other. Having watched the action of the trees the new owner has come to the conclusion that for the conditions in the Beaconsfield Upper locality 20 feet apart each way provides ample growing space. Apples only are receiving attention. Jonathans and Yates furnish the bulk of the crop, but associated with them are Statesman, Delicious, Winesap, Gravenstein, Rokewood and Granny Smith. Starting with Gravensteins, which usually become available for the Melbourne trade in the middle of January, the picking season continues until May, when the last of the Yates supply is gathered. With the exception of Gravensteins, all the apples produced at "Springfield" are suitable for export, and 1500 cases were sent to the British and European markets during the recent season. The fruit carried well, and realised the highest current rates. Comparing it with that produced in other southern localities, Mr Hamilton contends that the quality emphasises the suitableness of the hilly country over an extensive area at Beaconsfield Upper for the production of high-grade export apples. Emphasising that point, he stated that a consignment sent to the British markets from "Springfield" by the steamer Hobson's Bay, in the recent season, left a net return of 11/ a case for Granny Smiths and 8/ for Jonathans at the Pakenham railway station. Mr. Hamilton does not overlook the fact that the favorable exchange contributed largely to the result, but he believes that under normal financial conditions the export of apples from the Beaconsfield Upper district will give the growers satisfactory returns. In the first season after purchasing and undertaking the management of "Springfield" the yield was exceptionally light, and the condition of the trees suggested that they were not receiving sufficient nourishment. Imbued with that belief, Mr Hamilton concluded that the deep granitic loam needed the stimulus of a green manure crop. Field peas were sown throughout the orchard at the rate of nearly two bushels an acre, early in April, 1927. A heavy application of market garden manure was put in the soil with the seed. This had such a stimulating effect that the crop attained a height of over three feet, and was too dense in places to be effectively turned under when the land was being ploughed early in spring. In the following season the output amounted to approximately 6000 cases, and surpassed the heaviest yield recorded by the previous owner of the orchard. Since that time, a portion of "Springfield" has been green manured each season, with beneficial results. It has been ascertained that the use of 1 cwt. of super an acre with the peas at seeding time stimulates the plants equally as well as market garden manure, or the other nitrogenous preparations, restrains grossness of growth, and is much cheaper. Investigations satisfied Mr Hamilton that it was a waste of money and effort to put any of the prepared fertilisers into the ground unless the conditions were made favorable for bacterial activity by the presence of sufficient humus or vegetable mould. His appreciation of that important fact revealed a special faculty for en quiry which has led to good results in regard to all the operations which make for success in the profitable production of fruit. Having gained an insight into the principles governing the growth and bearing propensities of apple trees, Mr Hamilton disregarded the stereotyped methods of manuring, which some of the well intentioned district growers had furnished for his guidance. A study of the trees during the period of active growth, and the crops they were carry ing, suggested the kinds of manure which were likely to be of benefit in the following season. Apart from the purpose it served in stimulating green manure crops, super, by itself was found to be negligible so far as assistance to the fruit trees was concerned. Rotations of the market garden preparation and the complete or chard manure, at the rate of from 6 to .., a tree, applied in the latter part of winter, and ploughed in between four and five inchs deep, have given satis factory results. Two years ago, tests with nitrophoska, at the rate of 3lb. a tree, proved help ful, and demonstrated the value of that kind of manure. Whether it will be unduly forcing, remains to be seen, but Mr Hamilton is of the opinion that, as a variant, in conjunction with blood and bone, sulphate of ammonia and the com plete orchard manure, nitrophoska, will show a substantial margin of profit, not withstanding the cost of £22 a ton. Experience has convinced Mr Hamilton that it is not advisable to prune so heavily as some of the growers consider. Provided the centres of the trees are left sufficiently open for the admission of light and air, the branches, he found, produce more evenly sized and better quality fruit by being permitted to spread within reasonable bounds. For the regulation of the crops, spur pruning is preferred to thinning after the crops have formed. This season spur thinning has received special at tention, as there are indications of an exceptionally heavy crop. Observations have shown the beneficial effect of spraying the trees with red oil at the strength of one part to 20, soon after they have been pruned. In addition to destroying red spiders and scale parasites, the oil residue softens and improves the tex ture of the bark. Satisfactory results for the suppression of the black spot disease have been obtained by spraying the trees thoroughly with Bordeaux mixture, consisting of 6lb. of bluestone, 4lb. of lime, and 50 gallons of water, immediately a green tinge shows that the buds are beginning to expand. A second distribution is made when a tinge of pink indicates that the fruit flowers are opening. The mixture for this is used at the same strength on all varieties but Jonathans. To prevent skin russeting on the latter, the solution is weakened by the addition of 80 gallons of water instead of 50. Although diseases and parasites are as troublesome in the Beaconsfield Upper district as elsewhere, Mr Hamilton has been able to produce a high percentage of clean fruit. He attributes his success to close observation, and thoroughness of spraying when the pests are in the most vulnerable stages. [S5] Registry of Births Deaths and Marriages Death Index Victoria 1921-1985 "#D16354 age 78 [par Peter DRUMMOND]." [S10] New Zealand Government Birth, Death & Marriage Indexes "NZ BDM #M5437." [S185] Property Titles. ; PROV (Public Records Office Victoria), 1114-607 - Edwin Cecil Hamilton of Upper Beaconsfield Orchardist. [S185] Property Titles. ; PROV (Public Records Office Victoria), C/T 2856-105 - Edwin Cecil Hamilton of Upper Beaconsfield Orchardist. [S185] Property Titles. ; PROV (Public Records Office Victoria), C/T 2856-105 - Edwin George Hamilton of "Windsor Park" Upper Beaconsfield Orchardist. [S5] Registry of Births Deaths and Marriages Death Index Victoria 1921-1985 "#D8352 age 74." [S185] Property Titles. 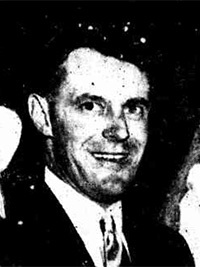 ; PROV (Public Records Office Victoria), 1114-607 - Edwin Cecil Hamilton died on 19 May 1961 Probate of his will has been granted to Mary Hamilton of "Springfield" Upper Beaconsfield Widow. [S185] Property Titles. ; PROV (Public Records Office Victoria), 1114-607 - Mary Hamilton of "Springfield" Upper Beaconsfield Widow. [S15] Newspaper - Village Bell "064-1988, p16 by John Milligan." [S11] Newspaper - Argus 23 Sep 1925, p31. [S14] Newspaper - Weekly Times, 8 Aug 1931, p49. [S218] Newspaper - The Dandenong Journal (1927-1954) "The Dandenong Journal (Vic. : 1927 - 1954), Thu 8 Feb 1934, p4." Marriage* 1915 Spouse: Margaret Jane Dunn. VIC, Australia, #M9415. [S2] Registry of Births Deaths and Marriages Federation Index Victoria 1889-1901 "#B24823. Reg at Ondit." [S181] "gives birth place as Beeac." [S185] Property Titles. ; PROV (Public Records Office Victoria), C/T 3447-303 - Percy Mansfield Hamilton of Upper Beaconsfield Orchardist - C/T 7174-751. [S185] Property Titles. ; PROV (Public Records Office Victoria), C/T 7174-751 - Frederick Douglas Beck of 1 Queen Street Melbourne Insurance Broker - C/T 8055-129. [S5] Registry of Births Deaths and Marriages Death Index Victoria 1921-1985 "#D22747 age 65 [par Henry DUNN & Mildred HAMILTON]." [S185] Property Titles. ; PROV (Public Records Office Victoria), C/T 7174-751 - Frank Maxwell Hamilton of Upper Beaconsfield Orchardist - C/T 8251-250. [S185] Property Titles. ; PROV (Public Records Office Victoria), C/T 7174-751 - C/T 8649-707 + 708. [S5] Registry of Births Deaths and Marriages Death Index Victoria 1921-1985 "#D6753 age 83." [S185] Property Titles. ; PROV (Public Records Office Victoria), C/T 8649-707 - Percy Mansfield Hamilton died on 21st March 1973 Probate of his will has been granted to Frank Maxwell Hamilton of Red Hill Road Upper Beaconsfield Orchardist and Alan Henry Hamilton of 208 O'Hea Street Pascoe Vale Electrical Engineer. (Creation of Easement - An Easement to Melbourne and Metropolitan Board of Works has been created over the land shown marked A). [S185] Property Titles. ; PROV (Public Records Office Victoria), C/T 8649-707 - C/T 9402-238 - Frank Maxwell Hamilton of Red Hill Road Upper Beaconsfield Orchardist. [S101] Electoral Roll for Australia, 1903 - 1980 "Division of Corangamite, Subdivision of Buangor." 1-042-B Hamilton Frank Max M 20/11/1992 2293. Stanley Hamilton enlisted on 16 Jun 1915, SERN 1934, when he was 24 years old and a farm hand. His unit, the 22nd battalion, embarked from Melbourne on 26 Aug 1915 on board HMAT A68 Anchises. He sailed together with his younger brother Frank. At Anzac he contracted enteric fever (typhoid), and after being ill with it for two months, he was sent to Australia for a change on 13 Mar 1916. He re-enlisted, SERN 12573, and returned to Europe on 23 Sep 1916 on board HMAT A49 Seang Choon, 3rd Field Artillery Brigade. He was a driver and saw service in France from Feb 1918. 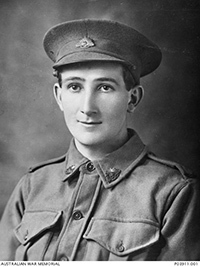 He had a very severe attack of influenza in April 1919 while still in England and returned to Australia on 3 May 1919. [S2] Registry of Births Deaths and Marriages Federation Index Victoria 1889-1901 "registered at Geelong." [S181] "gives birth place as Connewarre." [S35] Probate Records, PROV (Public Records Office Victoria), VPRS 28/P4, unit 2210; VPRS 7591/P3, unit 351. Frank Gordon Hamilton enlisted on 28 May 1915 when he was 20 years old. His unit, 22nd Battalion, 3rd Reinforcement, embarked from Melbourne on 26 Aug 1915 on board HMAT A68 Anchises. SERN 1904. He sailed together with his older brother Stanley. [S33] Australian Government: http://www.naa.gov.au/collection/search/index.aspx, Military File. [S181] "gives birth place as Leopold." [S10] New Zealand Government Birth, Death & Marriage Indexes "possible twin sister Margaret DRUMMOND NZ#B11983." [S185] Property Titles. ; PROV (Public Records Office Victoria), 1114-607 - Mary Hamilton died on 24 July 1966 Probate of his will has been granted to Edwin George Hamilton of Upper Beaconsfield Orchardist. [S35] Probate Records, PROV (Public Records Office Victoria), VPRS 28/P4, unit 3835; VPRS 7591/P3, unit 652. Marriage* 1915 Spouse: Percy Mansfield Hamilton. VIC, Australia, #M9415. Death-Notice* 5 Oct 1954 HAMILTON.—On October 4, at her home, Upper Beaconsfield, Margaret Jane, beloved wife of Percy, and loving mother of Max, Nancy (Mrs. Trotman), Alan, and Beth (Mrs Dowrick). —In God's Care. [S22] Victorian Government. BDM Index Victoria (online) "birthplace listed in death entry." [S11] Newspaper - Argus 5 Oct 1954 p13. 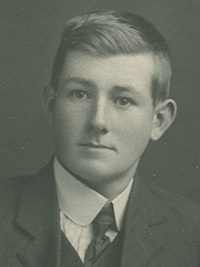 “Max” was born at Christchurch, New Zealand in 1916. When he was very young his parents moved to a farm near Beaufort and Max attended school at Middle Creek. Completing his studies, Max worked on the family farm until 1939 when they moved to Upper Beaconsfield. Here he met Henrietta Holmes, whom he married in 1947 and they settled in Red Hill Road. The couple has two sons, Trevor and Phillip. Max used to work from dawn till dusk and spent his working life caring for his land. He was a very loving and caring husband, father and later grandfather, and a very compassionate and generous man. He was a keen sportsman playing cricket, tennis and football. One of his great loves was fishing from a boat with friends and family - as a result, many Christmas holidays were spent camping with the family at Wilson’s Promontory. After his wife died Max found companionship with Stella, his cousin by marriage, and they have been a wonderful support for one another for the last five years. Stella found him a very caring warm person who was always willing to comfort and support other people whenever needed. 17 Nov 1948, TWO POPULAR members of our younger set, Miss “Tet” Holmes and Mr. Max Hamilton, were married here on November 6th. In the evening Mr. and Mrs. Percy Hamilton gave an open party in the Assembly Hall, which was crowded with well-wishers. Len Yates’ orchestra provided the music and a beautiful supper was served. [S218] Newspaper - The Dandenong Journal (1927-1954) "17 Nov 1948, p1 - photograph in Dandenong Journal." [S185] Property Titles. 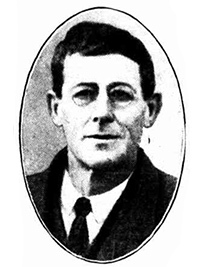 ; PROV (Public Records Office Victoria), C/T 7651-177 - Frank Maxwell Hamilton of Upper Beaconsfield Farmer - C/T 7754-181. [S185] Property Titles. ; PROV (Public Records Office Victoria), C/T 5814-608A - Alan Henry Hamilton Electrical Engineer and Frank Maxwell Hamilton Orchardist both of Albers Road Upper Beaconsfield - proprietors as tenants in common in equal shares - C/T 8019-080. [S185] Property Titles. ; PROV (Public Records Office Victoria), C/T 8019-080 - Isabella Murtagh of Upper Beaconsfield Married Woman. [S185] Property Titles. ; PROV (Public Records Office Victoria), C/T 8251-250 - Melbourne and Metropolitan Board of Works - C/T 8874-111. [S185] Property Titles. ; PROV (Public Records Office Victoria), C/T 8055-129 - Frank Maxwell Hamilton of Red Hill Road Upper Beaconsfield Orchardist - C/T 9117-934. Service 20 Nov 1989, remains collected, aged 68. [S185] Property Titles. ; PROV (Public Records Office Victoria), C/T 9402-238 - l/p 220681K - subdivided into lots One and 2 - C/T 9977-609+610 - Frank Maxwell Hamilton of Red Hill Road Upper Beaconsfield. [S14] Newspaper - Village Bell: 089-1992 p15. [S185] Property Titles. ; PROV (Public Records Office Victoria), C/T 9977-610 - cancelled as to part PS316325K - Lot 1 in C/T 10159-930 - balance transferred 21 July 1994 - Road C/T 10194-736. [S185] Property Titles. ; PROV (Public Records Office Victoria), C/T 8251-250 + 9117-934 - no further title available. [S218] Newspaper - The Dandenong Journal (1927-1954) "The Dandenong Journal (Vic. : 1927 - 1954), Wed 17 Nov 1948, p8."